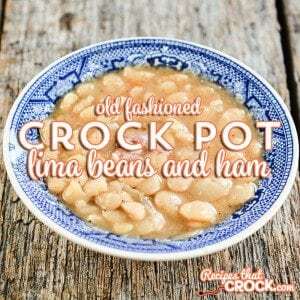 Old Fashioned Crock Pot Lima Beans and Ham - Recipes That Crock! 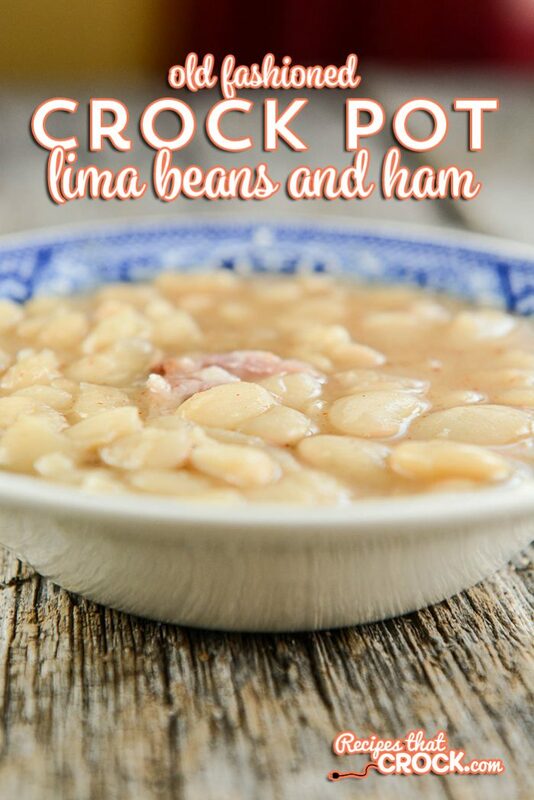 Old Fashioned Crock Pot Lima Beans and Ham is a delicious way to try lima beans if you haven’t tried it before. 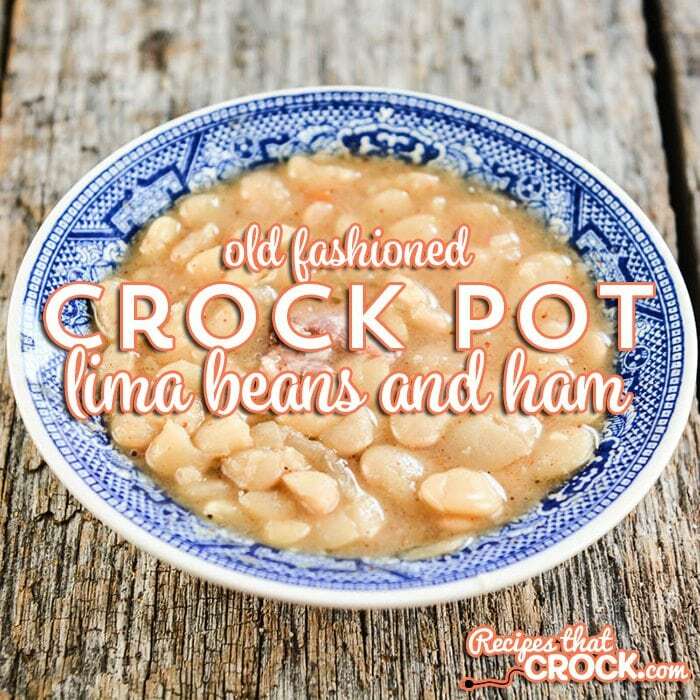 The dish is a little similar to traditional slow cooker beans and ham, but definitely worth a try if you haven’t yet tried lima beans the old fashioned way. Cris here. My family has always hated lima beans. I’ve always had a hard time getting them to try recipes with them. But then we went on vacation and they tried some that had been slow cooked all day with ham and they fell head over heels. I knew I could make them at home and get them to try… So I had Mikey use my recipe and try it on video! And boy oh boy am I NOT hearing complaints about mom’s lima beans anymore! You will need to use dry beans for this recipe. Dry beans are less expensive than canned and frozen but they do take a little more work. You will need to rinse and sort your beans and then either soak them overnight or using the “quick soak” method on the bag they come in. This little extra step will be sooo worth it. I used ham hocks in my recipe because I didn’t have a ham bone or leftover ham from a recent meal. Ham hocks can be found at the grocery store near where they sell hams. They are typically inexpensive and they bring so much flavor to the dish. If you cannot find them, you could substitute bacon in this recipe, however, I would imagine that the flavor would be a bit different. I used my 4 qt slow cooker for this recipe, but you could use a 5 or 6 qt, it just might take less time. This dish is great as a main dish or as a side. Our Old Fashioned Crock Pot Lima Beans and Ham will make you fall in love with lima beans! You never knew they could taste so good! Place beans in your slow cooker. Add ham hocks and onion. Cook on HIGH for 2 hours then turn to LOW for 4 more hours or until the beans are tender. 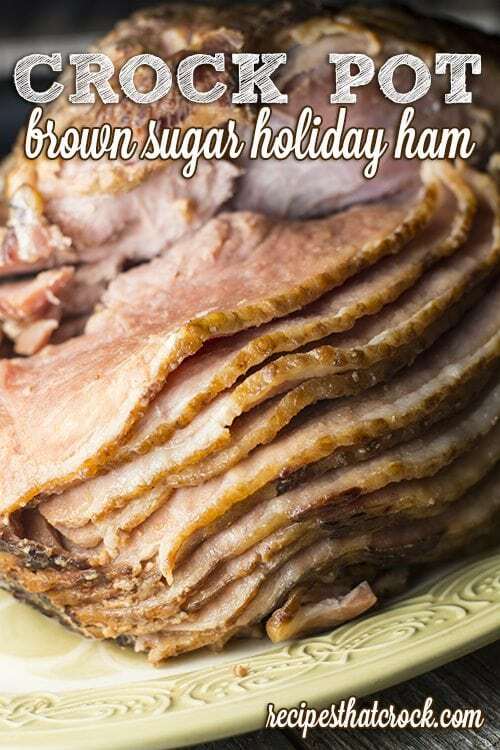 Looking for a great ham recipe? 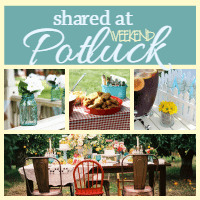 Looking for more left over ham recipes? 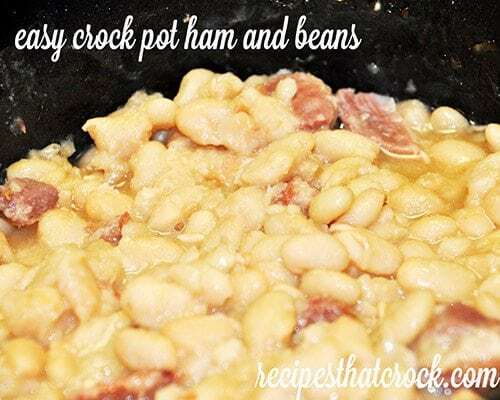 Check out our Easy Crock Pot Ham and Beans— we actually adapted this recipe to make our lima beans. 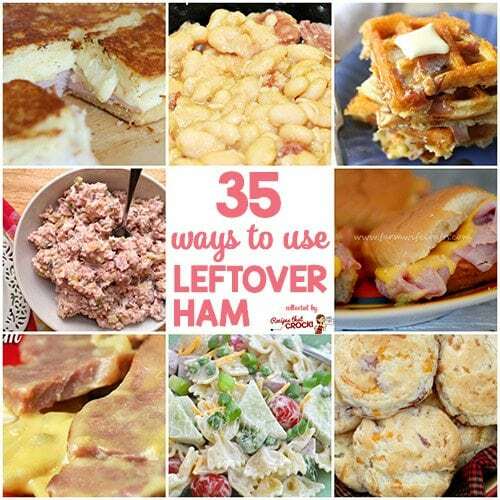 OR… check out our Great Ham and Leftover Ham Recipes Pinterest Board for an ALWAYS CURRENT list of all our favorite ham related recipes! I made this today with leftover ham and ham bone. I had never used a ham and bean recipe with onion and chili powder. It was a very good addition! My new(ish) fancy electronic crock pot stopped working about an hour after I started cooking this so I put the crock in the oven to finish cooking. The beans were delicious anyway! Left overs, especially when the liquid gets thicker, can be put into a baking dish, add some brown sugar and bake in the oven. Or, just add diced tomatoes and some sauteed onion, bacon strips to the top and bake in the oven. Great video and instructions. I just got all the ingredients and going to give this a try. Sharon- We are so glad you found us too!! In the ingredients you mention about soaking the beans. How long? I have been using dried beans for many years in my navy bean soup and they are soaked in a large bowl with water and 1 teaspoon of baking soda overnight to help tenderize them. Then rinsed before using the in my soup. it helps a whole lot to do that and the beans are very tender when cooked. 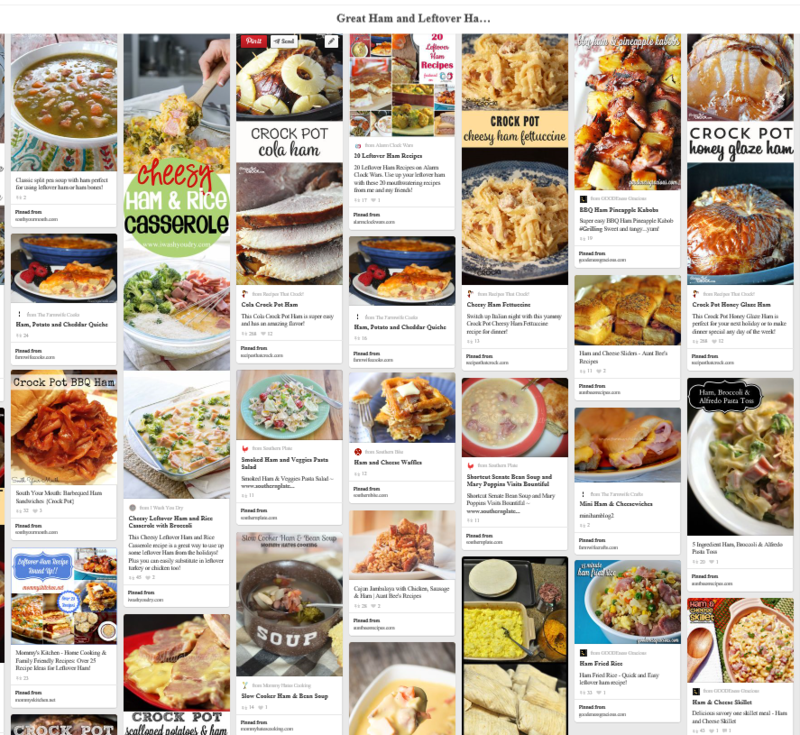 I made quite a few of your recipes some with slight modifications and enjoyed them very much. The bag your beans come in should tell you how long to soak. Ours said to do it overnight or do a quick soak on the stove (like Mikey shows in the video). Hope that helps! Enjoy!! The are definitely lima beans but I agree with you on their appearance colorwise looking like butter beans. Butter beans are larger in size though. I’m sure this recipe would be great with either! Enjoy! In the photo, theses look more like butter beans. Are they Lima or butter beans?